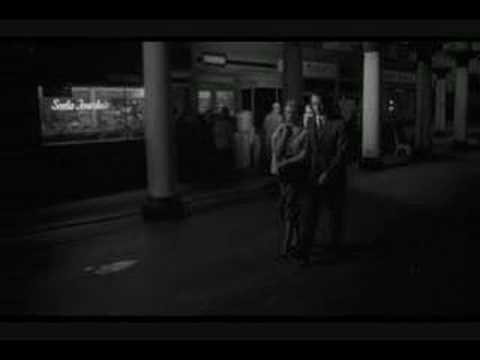 The following is one of the most discussed openings scenes in the film history: an audacious 3 minute uninterrupted crane tracking shot that sets up the story of Orson Welles's Touch of Evil (1958), the great American film noir crime thriller. Describe this shot. What sort of expectations is this image creating? The camera pans left and slightly upwards to reveal a couple coming down from a dark alley in an empty market. 1. From whose POV is this discovery revealed? 2. What type of music beat is heard on the background? A tracking shot follows the unidentified bomb man as he runs off. What is the significance of his sharp shadow projected on the wall? What type of music beat is enhancing the tension and setting the rhythm of the action taking place? The camera stops. A long shot shows the couple in the car and the other couple answering questions to the border checkpoint officer. Why is this type of shot important for building up tension? 1. A ________ captures the image from above as the couple drives off. 2. How is this incident creating tension on what is going to happen next? Note that the camera pans left to follow the car but it is blocked by the building. The camera is anticipating the movement of the car. The crane shot moves down to reveal the car emerging from behind showing a liquor store established by a neon light. The camera lowers down to ground level and moves at a steady pace directly in front of the car, again anticipating its action. The tracking shot pulls away from the moving car into a long shot. What is the significance of this long shot? What particularities is it revealing about the setting? Note that after following the couple in the car for over a minute, now the camera shifts its attention to another couple walking down by the use of another tracking shot. This is how the main characters of the film, the newly married couple Miguel Vargas (Charlton Heston) and Susan (Janet Leigh), are introduced. Note again, how Welles shifts the attention back to the couple in the car. Why do you think he is doing this? Note that up to this point, 2.35 minutes from the start of the film, there has been only visual information given to set up the sequence. Here it's the first time, dialogue has been used. The camera stops. A long shot shows the couple in the car and the newlywed answering questions to the border checkpoint officer. What has been said by one of the characters as an anticipation of the dramatic forthcoming event? Note how now the camera instead of following the car, it tracks into a long shot of the newlywed walking. Now the music is fading in the background to focus on the dialogue. As the camera captures the medium shot of the newlyweds, the sound of the bomb explosion overlaps the soundtrack. They turn their faces towards the blast, foreshadowing the disruption of their relationship and revealing the first cut over nearly 3 minutes of unedited sequence.